Posted on 15th December 2014 by Phil in News. 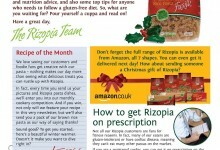 Welcome to our very first Rizopia Newsletter! We hope that our monthly letters will brighten your day as we bring you mouth-watering recipes, fitness and nutrition advice. So, what are you waiting for? Pour yourself a cuppa and click on the link below and read on!